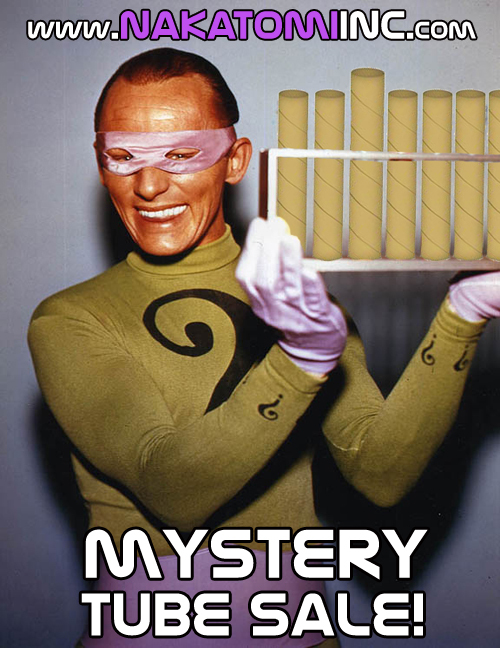 MYSTERY TUBE SALE Tuesday 11/13 at 2pm Central! Tubes will be for sale HERE on Tuesday 11/13– see you then! Tubes are $50 each– Each tube will have 5 prints in it-all suitable for framing. 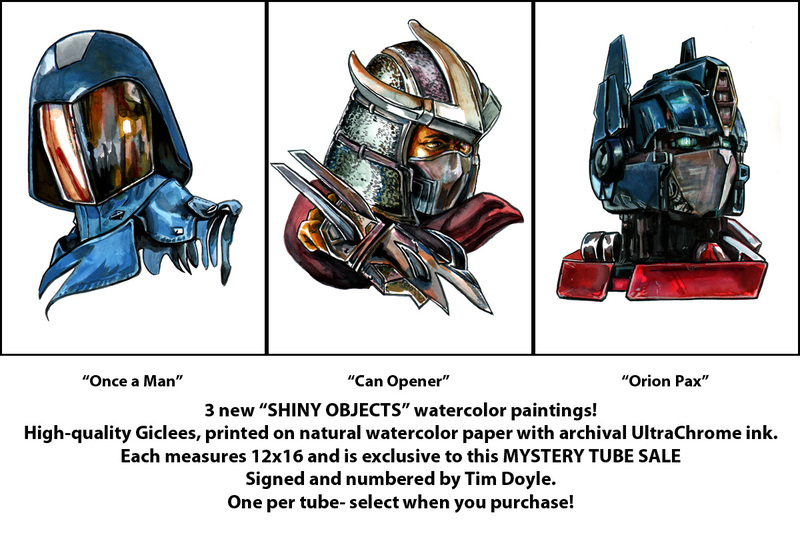 Each tube will come with one of 3 ‘SHINY OBJECTS’ prints by artist Tim Doyle, that are exclusive to this tube sale. You can choose which one you get in your tube! You can order 3 times, pick a different print for each order, and get the full set. 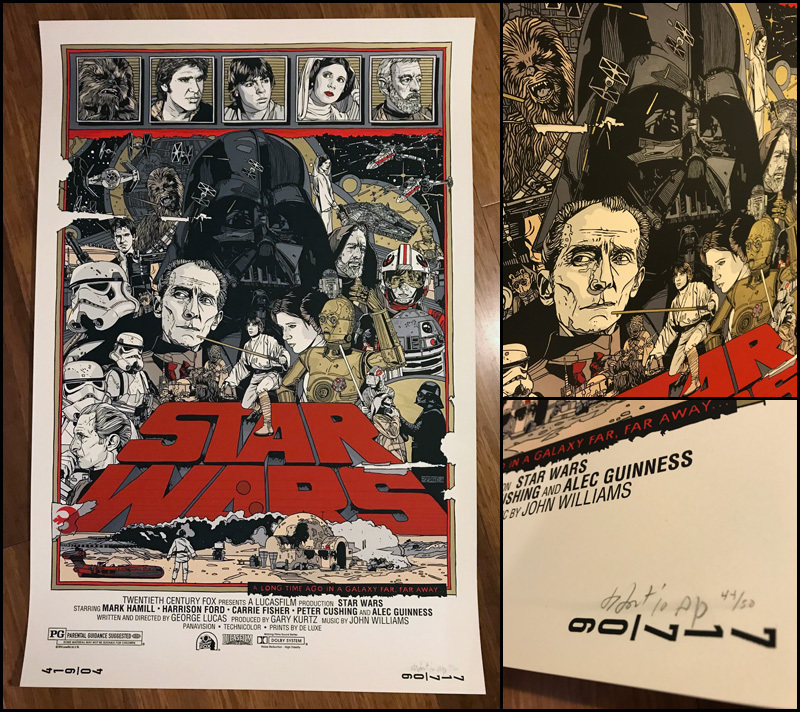 The Shiny Object prints measure 12×16 and will be signed and numbered by Doyle, and will never be for sale through the Nakatomi site on their own. Edition size determined by the number of orders each print gets! We’re randomly inserting awesome and unique test-sheet with about half of the orders! A test sheet is like 4 prints flying at your eyes at ONCE! A byproduct of the Silk-screen process, we run screens on scrap paper as we’re working on a project, and what you get is a random collage of color building up on a sheet of paper, until we judge that it’s ‘done’ and throw it on our stack of completed sheets! No two prints are alike! The Nakatomi Staff made sure each Test print this time around looks SOLID. People who are fans of randomness and the silkscreen process will love ’em! 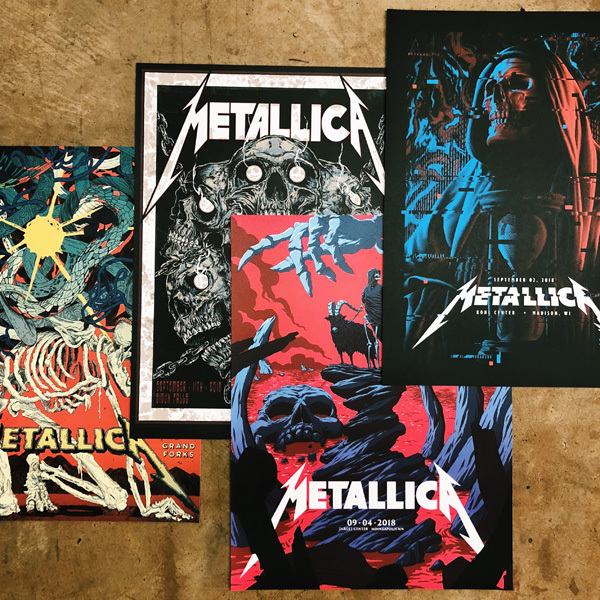 We’ve been printing a lot of METALLICA prints recently, so you’ll see a lot of completely unique Metallica prints in the mix! FYI- no tube will have more than ONE test sheet in it. WHAT ELSE IS IN THERE, NAKATOMI? 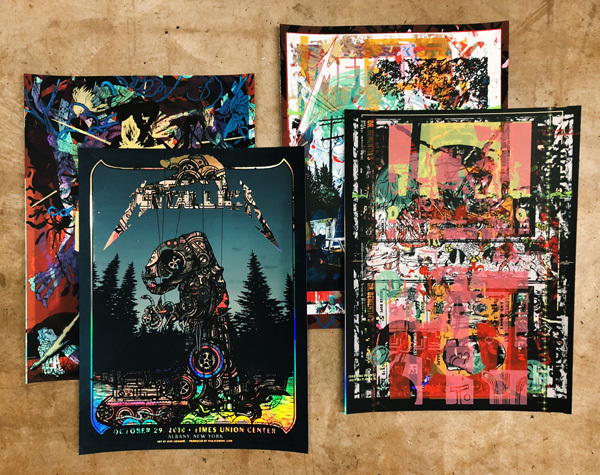 And speaking of Metallica…over the last few months, we’ve been managing the METALLICA VIP tour poster series, and we have a handful of each one left over. No tube will have more than one Metallica print. 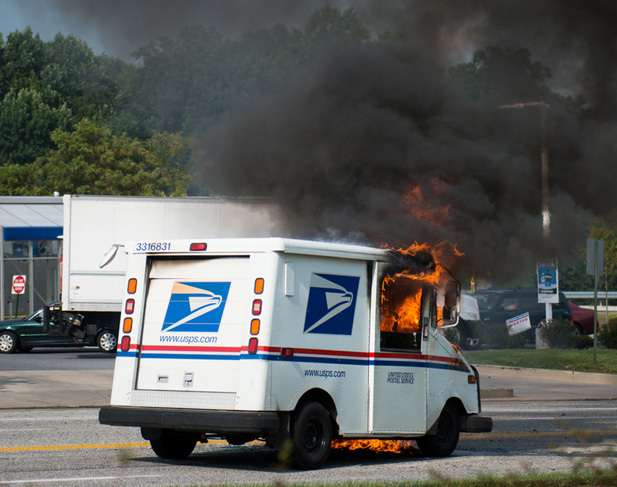 VERY SPECIAL “MAILMAN WILL HATE YOU TUBE*”! This is our fave part of the Tube Sale so we’re doing it again! There will be EXACTLY ONE of these- One lucky tube-buyer will receive ONE of EVERY single poster currently in print, that is published by Nakatomi! Literally DOZENS of posters- regular, variant, foil- WHATEVER edition- if we published it, you will get a copy of it. The winner last time got around 80 prints in the mail! Retail on this alone last time was over $3500. *- does not actually ship in a tube- this ships flat. You are welcome to buy as many tubes as you want- you will receive a copy of one of the exclusive prints in each tube. Only one tube per order– we cannot combine shipping- as we can only fit 5 prints in each tube! Get your clicky fingers ready- we’ve never had a Nakatomi tube sale NOT sell out. ← Bad Hombre-Lands NPS- Enamel Pin now available!